According to Spanish Prime Minister José Luis Rodríguez Zapatero speaking in an interview with the Wall Street Journal last Tuesday the European sovereign debt crisis is over. 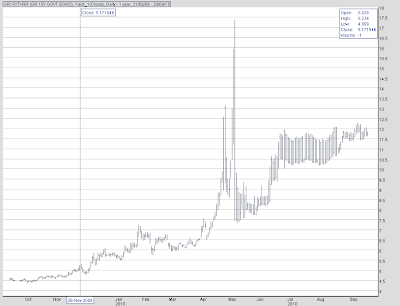 "I believe that the debt crisis affecting Spain, and the euro zone in general, has passed," Mr. Zapatero said. This is excellent news, but it comes with just one proviso, and that is that despite all such reassurances most financial market participants seem to be far from convinced that he is right. True Spain recently raised nearly €4bn in a successful government bond sale, with some observers suggesting the sale constituted but one more sign that what is still the eurozone’s fourth-largest economy had finally broken free from the group of “peripheral” European economies who have severe economic problems and whose debt is viewed by investors as especially risky. In fact Spain managed to sell €2.7bn of 10-year bonds and almost €1.3bn of 30-year bonds while at the same time bringing yields down noticeably from their earlier highs - to 4.144 percent in the case of the 10-year issue ( from 4.864 percent in June), and to 5.077 percent for the 30 year issue (from 5.908 percent in June). But, at the same time, in the background the extra yield that investors demand to hold Spanish 10-year bonds over German bunds has been steadily creeping back up again, and as of last Friday (24 September) it stood at 183 basis points, below the 220 level being asked in June but still more than double what it was at this point last year. Yet, despite all those nice words we hear from him, one of the things that is worrying investors right now is the real depth of Mr Zapatero’s commitment to reducing the deficit as planned, especially after he unexpectedly stated on August 10 that in his opinion some of the planned infrastructure spending cuts could be reversed, while on September 10 he reiterated the point, saying that lower borrowing costs may enable the government to "ease up" on some of the projected spending cuts. In fact the extra yield offered on Spanish debt has risen 33 basis points over the period since he started to mention the possibility. On top of which all the short term indicators we have been seeing suggest that the Spanish economy started to contract again in the third quarter. Indeed spreads on government bonds all along Europe's periphery have been rising steadily back towards (and even in some cases beyond) their May levels in recent weeks. Most notably the last week has seen both the Irish and Portuguese government 10-year bond yields surge to euro era records levels, in a way which could lead us to ask whether, rather than Spain snuggling back into the main group the big picture story at this point might not be that it is Irish and Portuguese sovereign debt that is being prised apart from the rest. So rather than being over, what the debt crisis now may be entering is a new stage, where one sovereign bond after another is being chisled out and sent off to join their Greek counterpart in the isolation ward. Actually, in this sense the present European Sovereign Debt situation does rather resemble the plot of the well known Agatha Christie detective novel "And Then There Were None". As told by M. Christie a group of ten people, all of whom have in one way or another been previously complicit in an earlier death, are somehow tricked into travelling together for what was intended to be a short stay on a secluded island. Once there, and even though the guests are apparently the only people on the island, they are - somehow, and one after another - systematically murdered. So, in a way which may eventually come to foreshadow scenes from the forthcoming meetings of the European Financial Stability Facility management board, each morning one guest less shows up for breakfast. One by one, and little by little, each participant becomes mysteriously overcome by a seemingly inexplicable bout of some fatal variant of what could be termed "systemic instability syndrome". 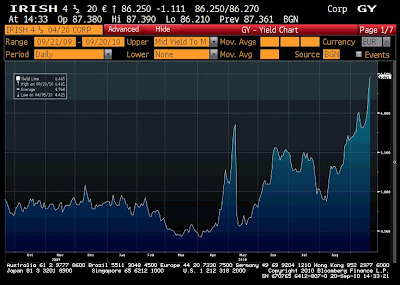 As I say, Irish and Portuguese yield spreads are significantly wider than they were May 7, the last trading day before Greece finally agreed to go for their €110 billion bailout package and the European Central Bank announced the initiation of its ongoing program of purchasing EuroArea government bonds in the secondary markets. And despite holding what was considered to be a "succesful" bond auction at the start of last week Irish 10-year bond yields, shot up`once more during the remainder of the week, hitting a new record high of 6.34 per cent (see Bloomberg chart below), while yield spreads over benchmark 10 year German Bunds spiked to 416bp, euro era another record. 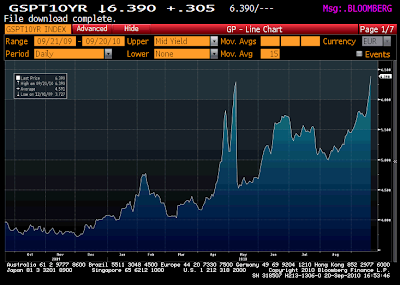 At the same time Ireland 5 year CDS shot up to 461 bps, which meant the cost of insuring Irish debt was $461,000 for $10m of debt annually over five years. At the same time yields on Portuguese 10-year bonds over comparable German bonds hit a record of near 4.25 percentage points Friday, while the Portuguese debt agency paid a euro era record of 6.24 percent to holders of its 10-year bonds and 4.69 per cent to holders of the four year-bonds in its own bond auction this week. 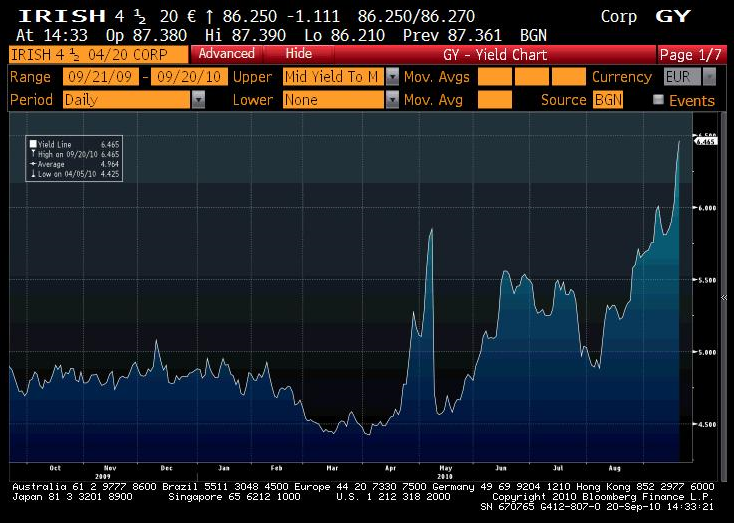 In last equivalent auction, Portugal had paid 5.32 percent on 10-year bonds and 3.62 percent on four-year bonds. Portugal’s budget gap widened in the first eight months of the year, indicating the government may struggle to rein in the euro-region’s fourth-largest deficit as its borrowing costs surged to a record. In each case the issue is different, since in the Irish case it was a sharp and unexpected contraction in the economy which became the major concern while in Portugal's case it was an apparent inability to reach the political agreement necessary to get the budget deficit under control. 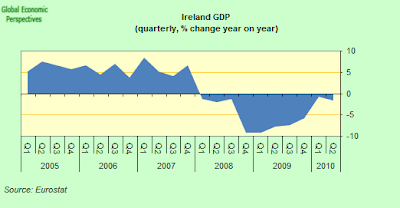 Data out during the week for second-quarter gross domestic product showed the Irish economy has never really left recession, since GDP contracted by 1.2% compared to the first three months of the year, following a downwardly revised 2.2% expansion in the first quarter. 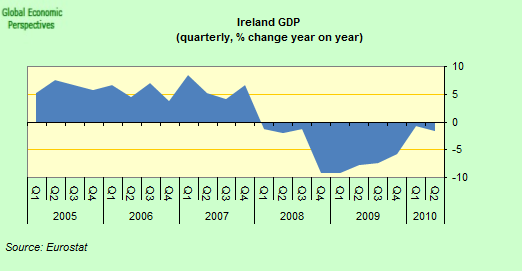 Irish GDP has now contracted on a quarterly basis for 9 out of the past 10 quarters, and there is no evident end in sight. In addition Ireland’s central bank governor Patrick Honohan saw fit to give a rather ill-timed press conference (unless he objective really was to force the country's government into the arms of the EFSF) where he urged the government to implement even deeper fiscal cuts to restore balance to the budget in what seems at this point to be a virtually unrealisable bid to regain investor confidence. All of which left many observers wondering just what the country can do in the present situation, since the budget is evidently deteriorating due to the severity of the economic contraction, and further cuts in spending by anyone (households, companies, government) are only likely to feed the contraction even more, in their turn making even more cuts necessary. Obviously Ireland is rapidly approaching a situation where it cannot move the situation forward based on its own resources. This feeling is only added to by the persistent rumours that subordinated bond holders to Anglo Irish bank may well not get re-imbursed in full. These rumours have found some confirmation in a report which appeared in the Irish Examiner suggesting that the Irish Finance Minister Brian Lenihan had given a strong hint that the riskiest lenders to nationalized Anglo Irish Bank may not get all their money back. Mr Lenihan apparently explained to the paper that the bank guarantee program which will be extended once it runs out at the end of September may only cover deposits and not subordinated debt. And if the interpretation put on events by the FTs John Dizard's is correct Mr Lenihan's delay in clarifying the situation is due to the fact that the Irish government is awaiting an EU Commission ruling on exactly this issue. His most recent official statement on the topic was that the Aglo Irish wind-up plan “is being prepared for submission to the [European] Commission for approval”. At the same time the EU’s Competition Commissioner, Joaquin Almunia, issued a statement that “a number of important aspects need to be clarified, and a new notification received, before the Commission is in a position to finalise its assessment and to take a decision”. Which Dizard interprets as meaning that while Anglo Irish might propose a buy-back of its subordinated bonds, and that buy-back might be included in an Irish government proposal, Brussels might, in the end, not approve the plan. Since this would effectively the first time in the current crisis that a significant group of investors did not have their losses underwritten (apart, of course, from the rather unfortunate Lehman incident), decision makers may be rather apprehensive, since no one really knows how the financial markets would react. Yet speculation some such decision will be taken remains rife, as witnessed by the decision by Moody's rating agency to downgrade Allied Irish ratings. Moody's cut Anglo Irish's senior bonds by three notches to Baa3, the last level before junk, but the markets' main focus was on the deep, six-notch cut in the bank's subordinated debt, to Caa1, which indicates that bondholders will be forced to pay for some of the expected bailout. 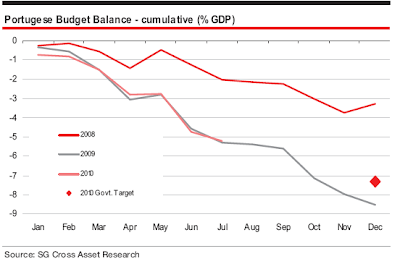 In the Portuguese case it is the budget deficit issue which is unsettling the markets, with the spread widening sharply following the revelation that far from the deficit being reduced is was actually increasing. According to the latest data from the Finance Ministry the central government’s shortfall during the first eight months of the year rose to 9.19 billion euros from 8.74 billion euros over the equivalent period in 2009. 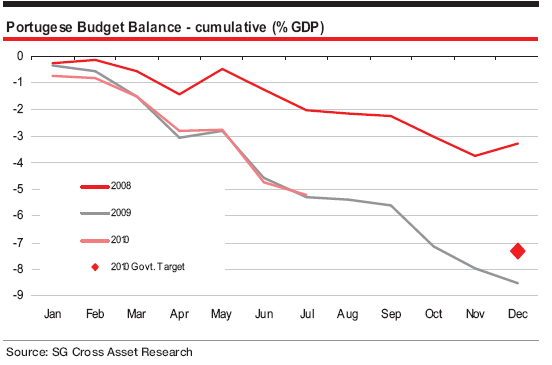 Previously the 2010 deficit had been almost exactly tracking the 2009 one (see chart from Societe Generale below). Portugal’s borrowing costs surged to record levels on the news, and while the spread subsequently eased back to 388 basis points, the level is still close to the zone in which Greek bonds were trading in April just before the EU offered the country emergency loans to avoid default (see Greek 10 year spread chart below). What this means is that this year's overall public deficit could well come in at around 9 percent of gross domestic product unless there is a radical change in policy during the last few months of the year. According to its commitments to the EU Stability Programme, the Portuguese government should be aiming to reduce the overall deficit to 7.3 percent of GDP in 2010 from last year’s 9.3 percent. The government has pledged to reach the target, with Finance Minister Fernando Teixeira dos Santos saying that the country “can’t afford” not to, but so far there is little evidence that it will be able to do so, and especially with all the political bickering that is now going on in the background. In all these cases, including the Greek and Spanish ones, this issue is not simply one of stimulus versus austerity (always a false polarity when it comes to the situation on the Euro periphery). The real issue is how to restore growth to highly-indebted and structurally-distorted economies, since without growth the debt to GDP ratios will not come down, and the burden of the debt will not be reduced. So more borrowing is not what these countries need right now (other than to aid short term liquidity). What the countries involved all need is more exports and larger industrial sectors, and no one seems to be very clear how they are to achieve them. Simply running a double digit deficit to generate less that 1% (in the best of cases) GDP growth is not exactly a "wise" use of resources. Evidently using deficit spending to cushion programmes which would lead to a surge in exports would make sense, but in no case is this really being done, and all the emphasis is simply going on what may turn out to be a rather fruitless and self-defeating programme of achieving fiscal rectitude. The result is that the peripheral countries are one by one being steadily "decoupled", with Portugal and Ireland now moving up towards Greece, as the following two charts from Citi Research clearly show. 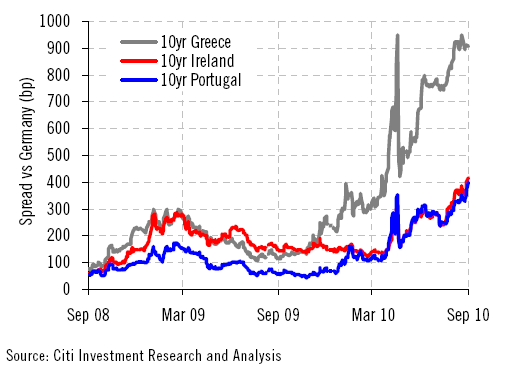 For quite a long time the Irish and Portuguese spreads simply moved in harmony with the Greek ones, widening as the Greek spread surged upwards. 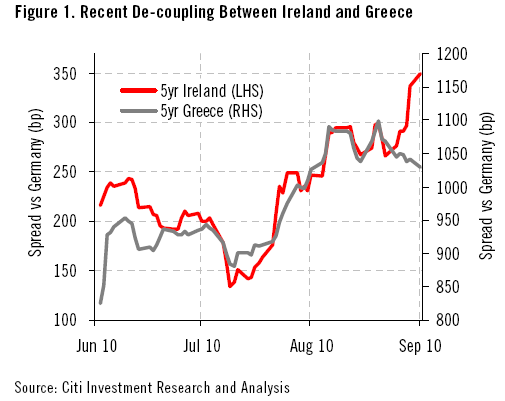 But now it is Greek debt which can be adversly affected by sentiment over the situation in Ireland or Portugal, and not the other way round, and meanwhile the other two countries slowly but surely are moving on up there to join their Greek counterparts as the second of the two charts (which show the recent relative movements in Greek and Irish spreads) seems to demonstrate. Naturally the ongoing deterioration in the situation requires bold and far reaching action from the Commission and the ECB. Obviously we should expect to see renewed activity on the part of the ECB, buying an increasing number of eurozone periphery government bonds. Their activity on this front has been increasing of late, but weekly bond purchases are still well below 1 billion euros a week level seen at the height of the crisis in May and June. Evidently we will see calls for more of these purchases in the days and weeks to come, but what is striking at the present time is just how ineffective they have been in containing the damage. The ECB’s bond buying program is effectively the second pillar in the EU crisis containment mechanism established in May. The other one is the Luxembourg-based 440 billion-euro European Financial Stability Facility, headed by former European Commission official Klaus Regling. Mr Regling has also been actively campaigning to calm markets in recent days. "It would be preferable if we didn't even have to intervene," he told the German magazine Der Spiegel in an interview, "In fact, I believe that's the most likely scenario." 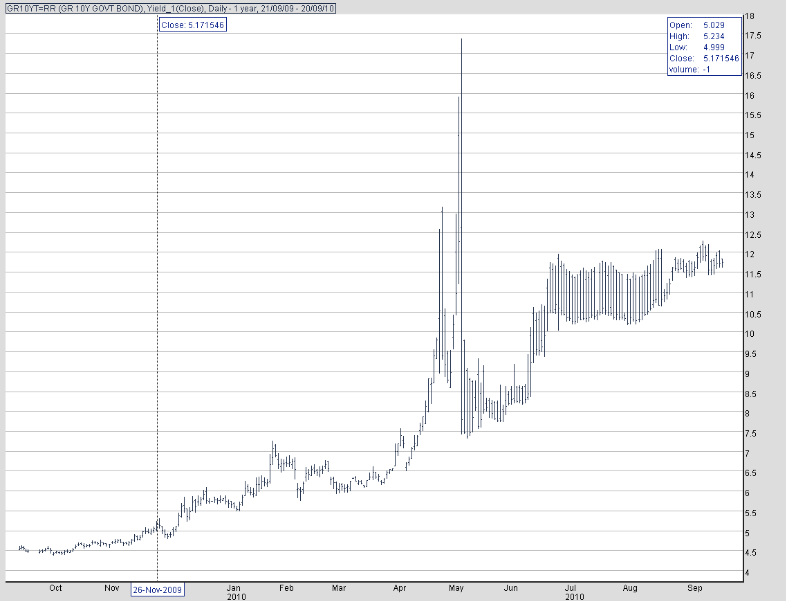 His hope then is that the very existence of his organization will bring calm to investors and deter speculators. "If that's the case, we'll close up shop here on June 30, 2013," he said. Morgan Stanley’s Chief Global Economist, Joachim Fels remains pretty unconvinced by all of this. “Strains,” he wrote in a recent research report, have now reached a point where "one or several governments" may soon have to resort to the rescue mechanism. "Neither the European sovereign debt crisis nor the banking sector crisis has been resolved and both continue to mutually reinforce each other," he said, adding that the EU's stress tests for banks had manifestly failed to restore the necessary confidence. Fels's conjecture didn't need that long to get some confirmation, since according to the German newspaper Handelsblatt the ECB was last week actively considering recommending that Ireland avail itself of the fund. The Central Bank declined to comment on the story, and simply pointed out that any decision on the matter was a question for national governments, which is formally correct (and obvious) but doesn't mean that they wouldn't in fact have recommended such a move if asked. So, like former US Treasury Secretary Hank Paulson before them, Europe’s leaders, having armed their bazooka may soon need to fire it. Indeed Mr Regling’s optimism that his organization may quietly disappear from the scene is not generally shared by investors, who as we are seeing seem to be continuously pricing in an ever greater likelihood of intervention. Meantime, according to a report in the Financial Times over the weekend, Europe's leaders are once more at odds among themselves about just how much carrot and how much stick the various national governments need to get their economies back into line. Predictably it is Paris talking about carrots, and Berlin who is talking about sticks. But all this talk of what to do about those countries who in the future fail to stick to the new set of rules which are apparently being prepared monumentally misses the point: what we need are some policies which help the most affected economies get out of the mess they have found themselves in following the way the monetary and fiscal policy rules were implemented last time round. According to one popular analogy currently circulating , the EuroArea countries could be likened to a group of 16 Alpine climbers scaling the Matterhorn who find themselves tightly roped together in appalling weather conditions. One of the climbers - Greece – has lost his footing and slipped over the edge of a dangerous precipice. As things stand, the other 15 can easily take the strain of holding him dangling there, however uncomfortable it may be for them, but they cannot quite manage to pull their colleague back up again. So, as the day advances, others, wearied by all the effort required, start themselves to slide. First it is Ireland who moves closest to the edge, getting nearer and nearer to the abysss with each passing moment. And just behind Ireland comes Portugal, while some way further back Spain lies Spain, busily consoling itself that it is in no way as badly off as the others who have already lost there footing. But if Spain cannot hold out, and all four finally go over, each dragged down by the weight of those who preceded them, then this will leave some 12 countries supporting four, something that the May bailout package only anticipated as a worst-case scenario. In the event that this is finally what happens, Mr Reglin will certainly find that the quiet life has come to an end for him, and that he has plenty of work to do, as will Mr Trichet’s successor at the ECB. In the meantime all the rest of us can do is wait and hope, firm in the knowledge that having come this far, we can only go forward, since there is no easy way back down to the point from which we started. But for heavens sake, the only thing we don't need while we sit here biting our nails is to be told by someone who manifestly has no idea what he is talking about that the danger has already past, even as we slide, inch by inch, onwards and downwards towards the chasm that gapes beneath.